In the Hazelwood neighborhood, inside the IRCO Community Center, hundreds gather for the “Slavic and Eastern European Heritage Celebration and Open House”. 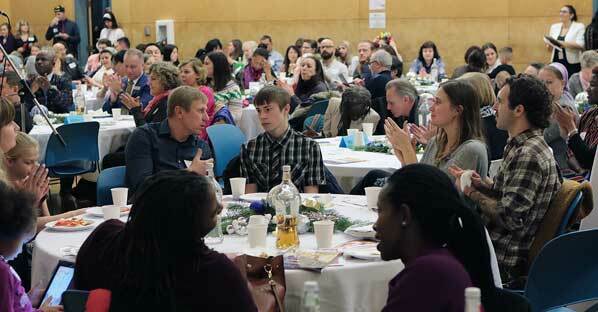 The mood was festive in the Sokhom Tauch Community Center at the Immigrant and Refugee Community Organization (IRCO) campus on the evening of January 10, as the “Slavic and Eastern European Heritage Celebration and Open House” was getting underway. 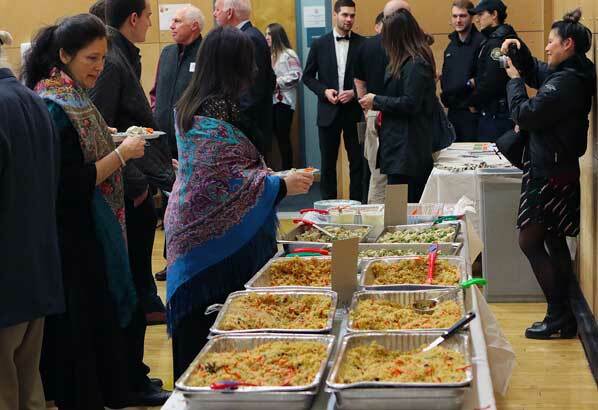 Reservations for the free event “sold out” within hours; an estimated 225 people attended the event – which featured culturally-appropriate food, music, and dance, plus speeches. 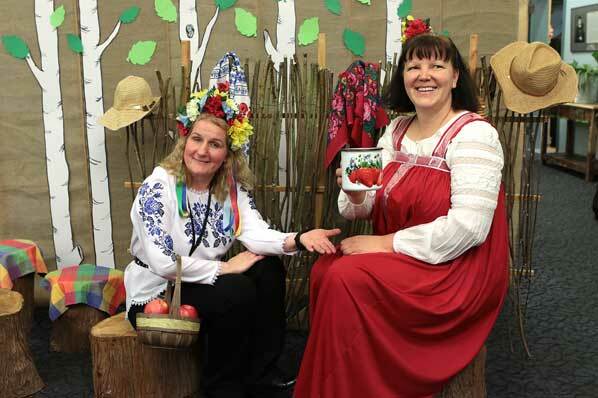 At a cultural display, Melli Salvador, originally from Ukraine “but I grew up in Uzbekistan”, wears a traditional celebration dress, while Lilya Yevseyeba, from Samara, formerly known as Kuybyshev, Russia, wears a traditional Russian “everyday” dress. Telling how this celebration came to take place is IRCO Communications Development Associate Jaimee Haddad. 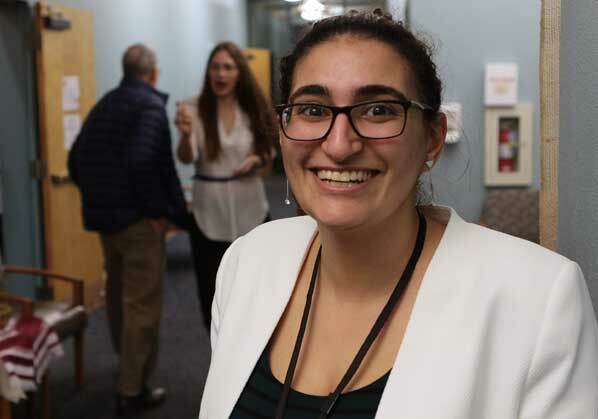 “After Mayor Ted Wheeler issued a proclamation the January 7-14 as ‘Slavic and Eastern European Heritage Week’, we sent out invitations to this; and, as you can see, the outreach efforts of IRCO’s Slavic community leaders was successful,” remarked IRCO Communications Development Associate Jaimee Haddad. 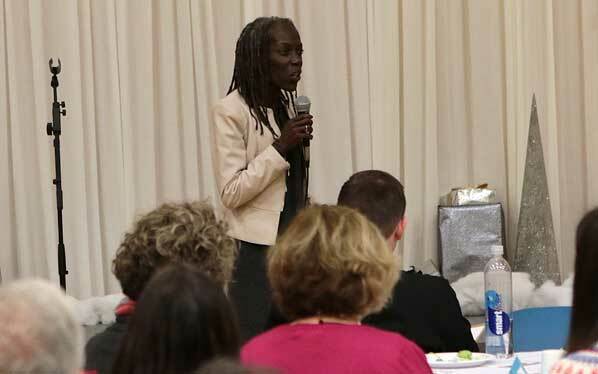 “This dinner and celebration is important the mission of IRCO, because our Slavic community is the second-largest immigrant and refugee committee in Multnomah County,” Haddad told East Portland News. Food sourced from Slavic and Eastern European caterers and bakers make up this toothsome and bountiful buffet. “Though this event, and with all of our programs, we’re working to help increase the visibility of the Slavic community, and we’re also recognizing that immigrant and refugee communities deserve to be celebrated for preserving their heritage,” Haddad exclaimed, as she introduced us to their “Slavic Leadership Program” coordinator. “Coming from Ukraine, and having lived in the United States for three years, I personally understand the challenges of immigrants,” said IRCO Slavic Leadership Program Coordinator Andrii Nagornyi. 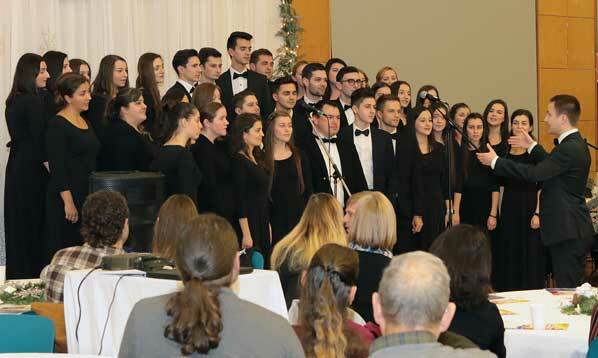 Comprised of youth singers from 13 Portland area Slavic churches, the Portland Christian United Choir performs. “For example, a problem faced by people from the Slavic and Eastern European community is that we look like any other American; yet, although we are now Americans, many of us have difficulty speaking English, which provides barriers that mainstream people do not have. 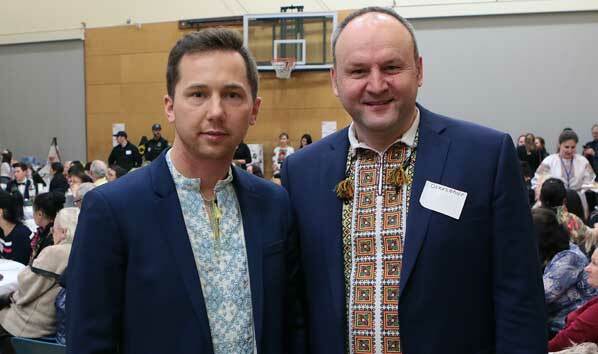 IRCO Slavic Leadership Program Coordinator Andrii Nagornyi spends a moment with Advisory Council member and Ukrainian Federal Credit Union NW Regional Branch Manager Oleksandr Moskal. Then, Nagornyi introduced us to Oleksandr Moskal, the regional branch manager of Ukrainian Federal Credit Union NW. “As a person originally from Ukraine, and working with a growing and prospering financial intuition, I accepted the invitation to join the IRCO Slavic Leadership Program Advisory Council,” Moskal explained. Greeting the audience on Mayor Wheeler’s behalf is Portland City Commissioner Jo Ann Hardesty. To learn how IRCO endeavors to “empower immigrants and refugees from around the world to build new lives”, see their official website: CLICK HERE.